A 1985 agreement between the U.S. and Japanese governments gives civilian aircraft permission to enter U.S. military training airspace around Iejima at an altitude above 5000 feet (1524 meters). However on March 29 this year, the Marine Corps stated its understanding that passage of civilian aircraft is not permitted at all when the training airspace is in use by the U.S. military. This is another indication that the U.S.-Japan Status of Forces Agreement (SOFA) is becoming merely a hollow shell. There has been no mention of whether or not the agreement made in 1985 is valid. 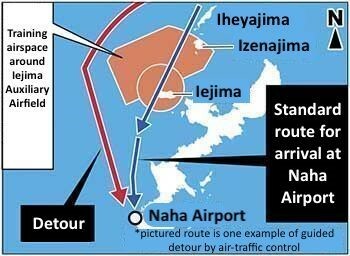 Domestic flights coming from outside Okinawa and arriving at Naha Airport have to detour around Iejima training airspace. The U.S. Marine Corps stated that flights of civilian aircraft are not restricted when Iejima training airspace is not being used for military activities. But it also expressed its understanding that if the airspace is in use, then passage cannot be permitted even above an altitude of 5000 feet and air-traffic controllers alert civilian aircraft in the vicinity that they must divert their courses. At a House of Representatives Budget Committee meeting in March 1985, the director-general of the Civil Aviation Bureau of the Ministry of Transport (now the Ministry of Land, Infrastructure, Transport and Tourism) explained that they had reached an agreement with the U.S. that flights arriving in Naha were permitted through Iejima training airspace above an altitude of 5000 feet. Up to this point civilian aircraft have passed through the Iejima training airspace safely above 5000 feet without hindering U.S. military activity, because the U.S. military normally conducts training at low altitudes in this airspace. The Ministry of Transport explained in the National Diet that starting in April 1985 it would enforce this agreement. According to aviation personnel, however, several years later flights were being restricted again. Currently, entry into Iejima training airspace at up to an altitude of 15,000 feet is prohibited, so if the training area is in use, civilian aircraft coming to Naha from the north fly in accordance with air-traffic control’s instructions and detour all the way around this airspace. According to aviation personnel the government is normalizing this detour.